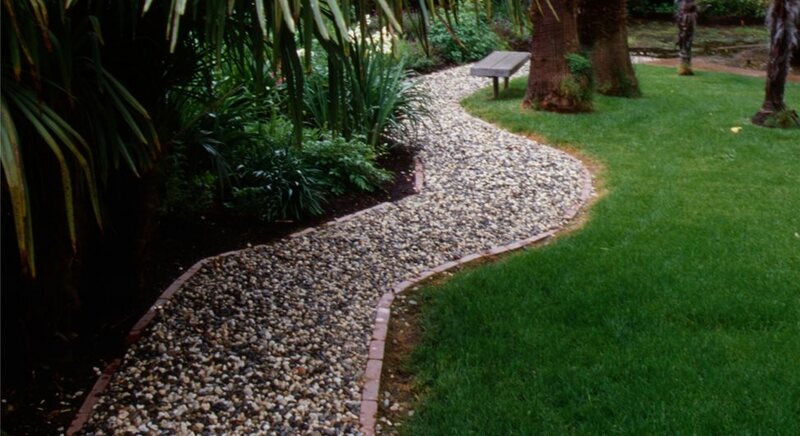 A French drain located beneath this gravel walkway provides drainage for adjacent lawn and planting areas. 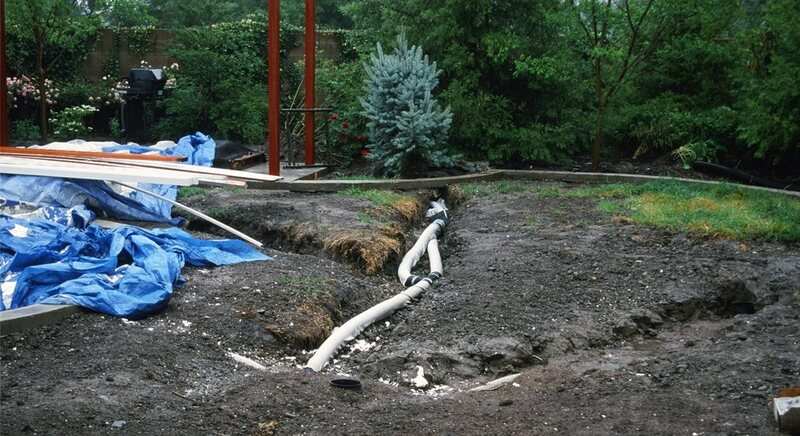 Perforated drain line may be laid into a French drain then packed with gravel before backfill and finish grading. Spot elevations tell the design if there is a low spot such as this which can become a quagmire in wet weather. 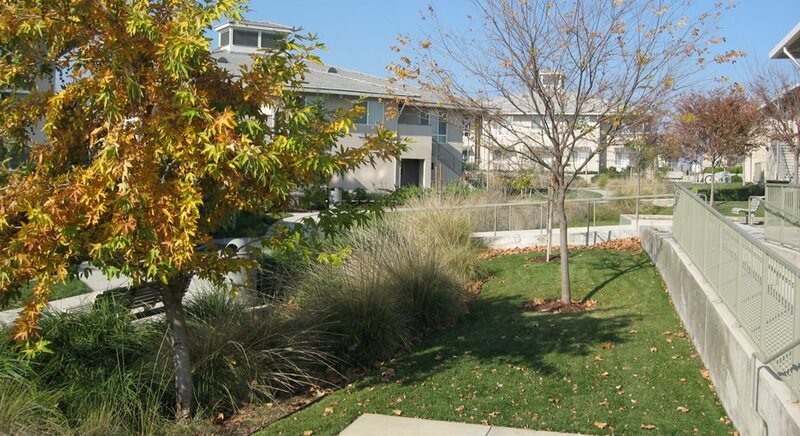 This multifamily complex is drained into a single swale planted with grasses and plane trees to slow velocity and disguise its visibility in the dry season. 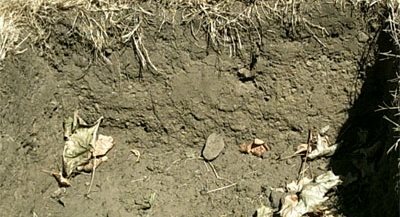 Digging a test hole not only evaluates how fast your soil drains, it also reveals whether dense soil or hardpan exist there. 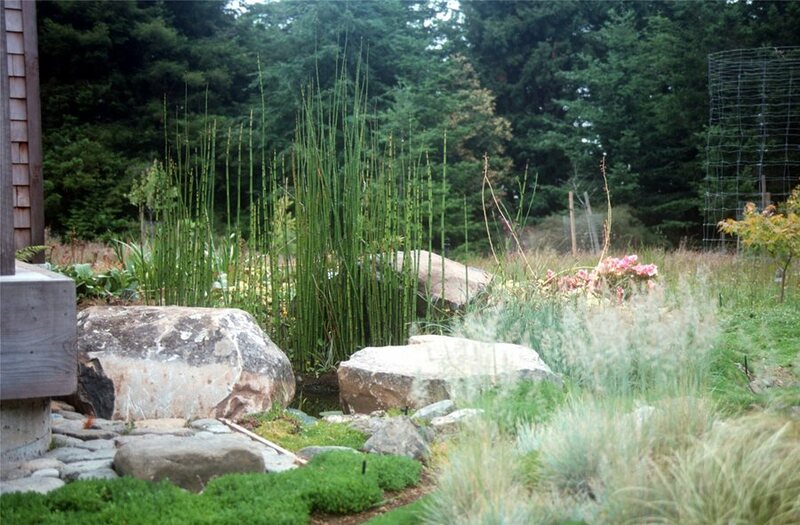 This rural property turns a problem low spot into an attractive wetland bog garden. During construction the contractor trenches for the underground drainage system that will connect all drop inlets throughout the property. Later in the construction process the drop inlets are positioned and grates are added to keep litter out of the drain lines. During the dormant season it's easy to see how this grassy woodland was graded to surface drain into this meandering swale. 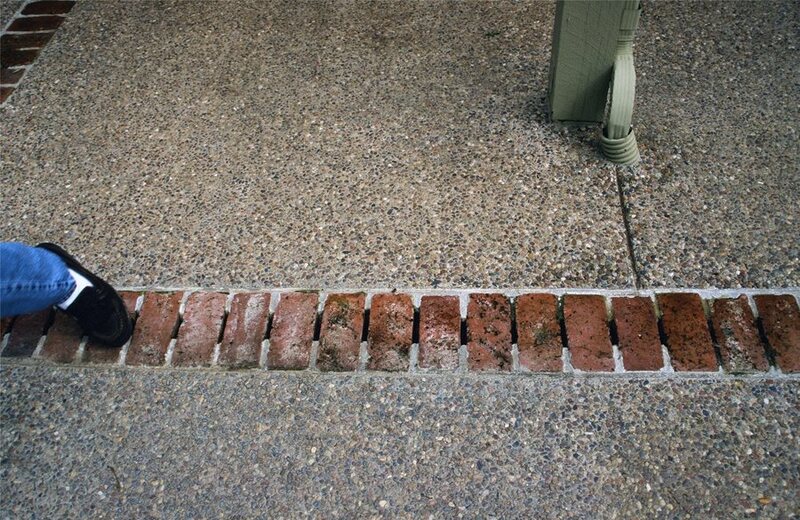 A trench drain allows large surfaces to drain to a linear catch basin positioned beneath a brick accent band in the paving. 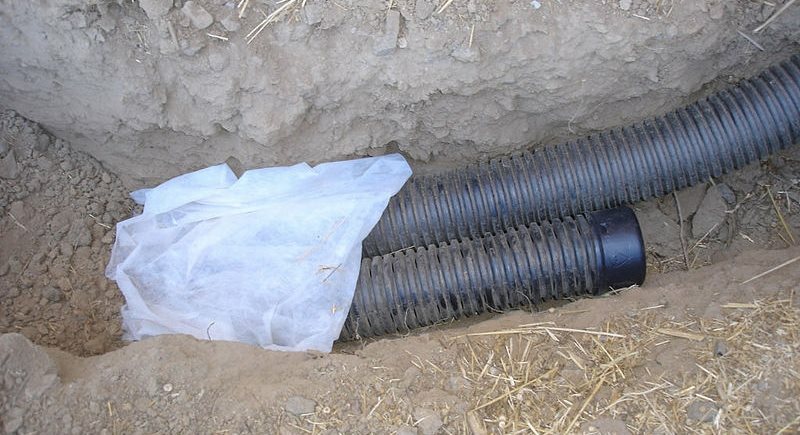 Where land is flat, soils are dense or the water table is high, a well designed drainage system is a priority. 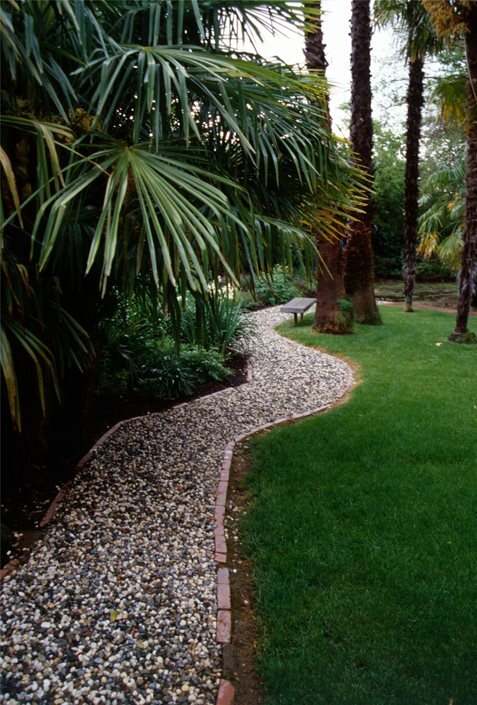 Without proper drainage solutions in place, water may collect to undermine structures and drown expensive plants, turning parts of your new landscape into perpetually wet swamps. 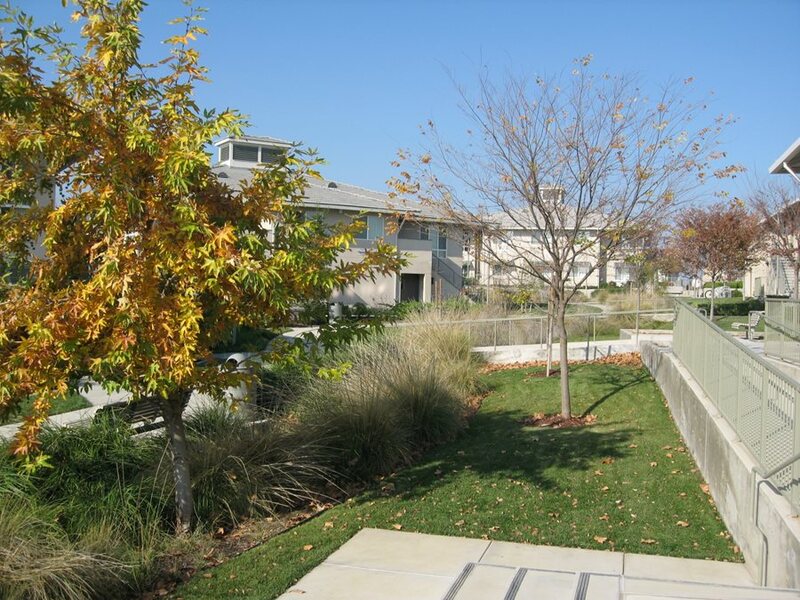 This can be the most important issue to a landscape architect due to this potential for damage. 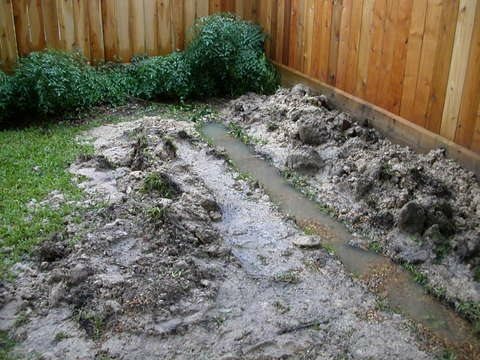 Backyard drainage may also be overlooked entirely by a designer poorly trained in grading and drainage. A good designer will analyze the nature of your yard, and may "shoot the grades" to establish the exact topography no matter how flat the site may seem. Spot elevations tell the designer where problems lie so that she can solve them through design. Ground water can also play an important role in drainage, and it is directly related to rainfall patterns. In the low lying areas of the South, the water table can be just inches below the surface. Such conditions create all sorts of problems for construction and limit planting options. Find out what's going on underground with this simple test. Dig a hole about two feet deep and as wide. Fill it to the top with water. If it drains away within an hour your drainage is excellent. If it takes 12 hours to drain, there may be problems. 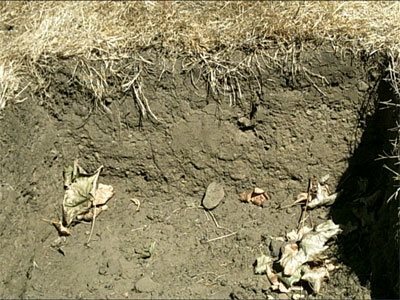 If it takes more than 24 hours to drain, then there is a serious problem that could impact the deep root zone of trees and shrubs. 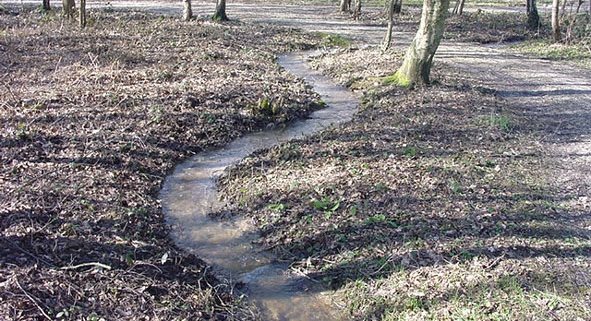 Homesites with clay soils suffer problems with lingering surface water. In theory every lot was graded to drain so that water in the backyard flows through a swale down the sideyard to the curb or storm drain. 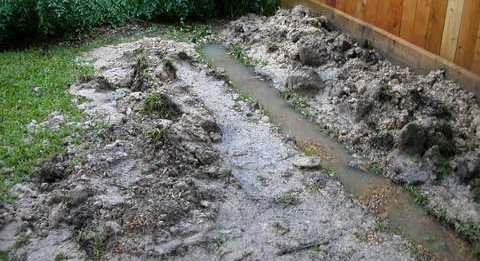 The reality is that builders don't always get their grades right and water becomes trapped, causing muddy zones in lawns and planting areas (see Lawn Drainage). When your designer creates the new drainage plan, it may utilize surface grading to ensure there is enough fall to drain. If there is not, another option must be found. 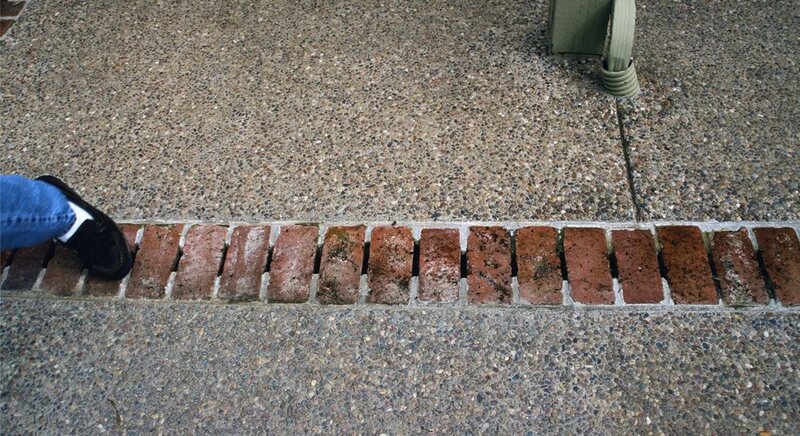 The French drain is an age old drainage solution that gathers water and provides a place underground where it may take its time percolating down through dense soils. It is essentially a trench that is dug to any depth and filled with gravel and possibly a perforated drain line. 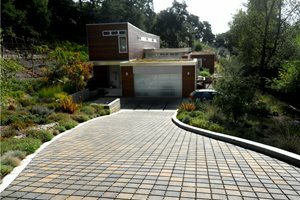 Roofing felt or geotextiles are laid over the top of the gravel and the soil replaced. The surrounding area is graded to drain to this trench so water no longer gathers on the surface to create problems. Where hardpan layers exist, the entire site may suffer poor drainage and standing water. This is too great a challenge for spot solutions. Insist on a site-wide grading and drainage plan with an underground system of pipes fed by drop inlets or trench drains. 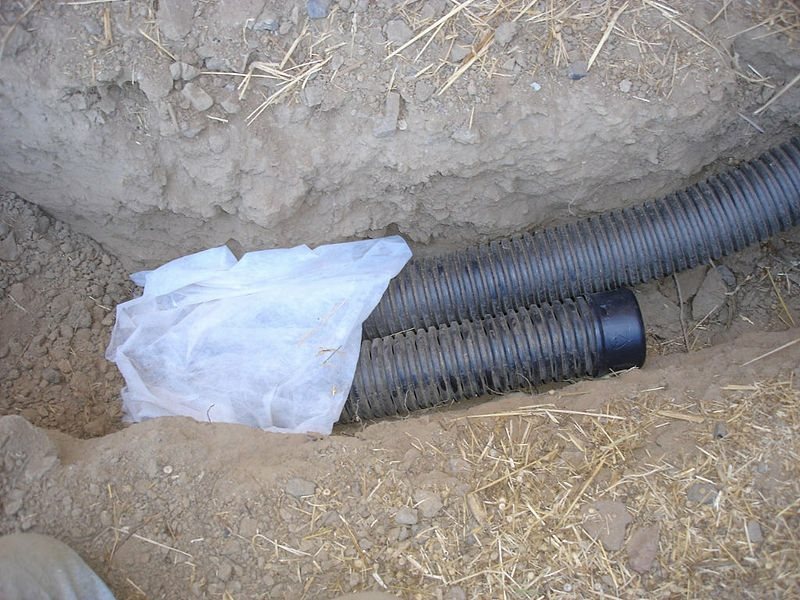 The advent of easy to install plastic piping makes it easier to move water off site and directly into the storm drain. 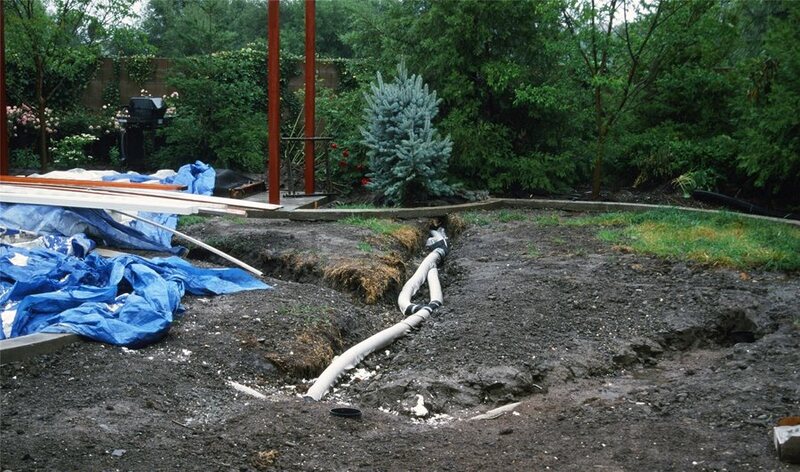 The drainage plan may prove to be the most important part of your project in areas of high rainfall such as Florida or Seattle where heavy flows are common. Such drainage costs more to install, but it pays for itself time and again. Where there is no storm drain or it is inaccessible, this kind of system may flow into an underground sump. This is a large hole dug and packed with gravel where water stands until it drains away. With luck, digging of a sump punches through hardpan into more porous soils deeper down. If your yard has a high water table or poor drainage it can be difficult to find trees that will thrive. 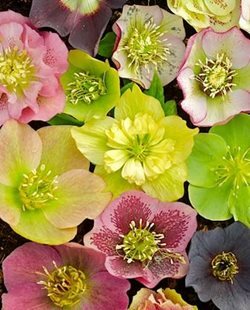 Here is a list of 10 trees for a wet garden. 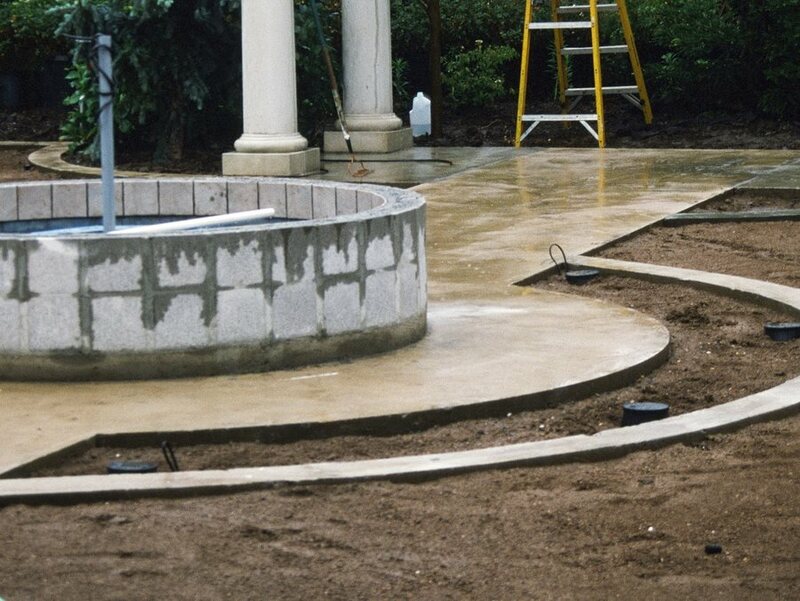 Low lying areas with a high water table can make landscaping a real challenge. Plant roots in saturated soil during the growing season are denied oxygen, and quickly rot just like an overwatered house plant. 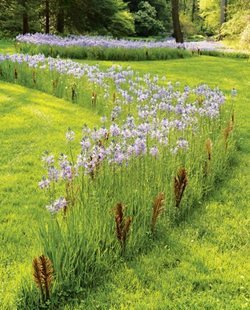 Certain plants that originate in river bottoms and wetlands do quite well in high water landscapes. 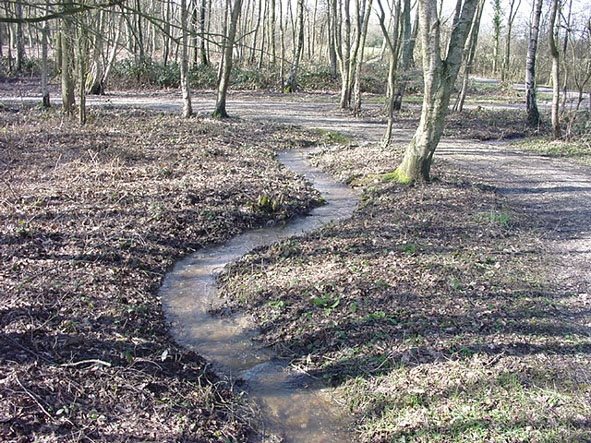 The best choices will be riparian species from local bogs, fens and swamps naturally adapted to your climate and soils. Trees from similar wetlands elsewhere in the world also make good candidates. These provide more diversity than what is native to local plant communities. 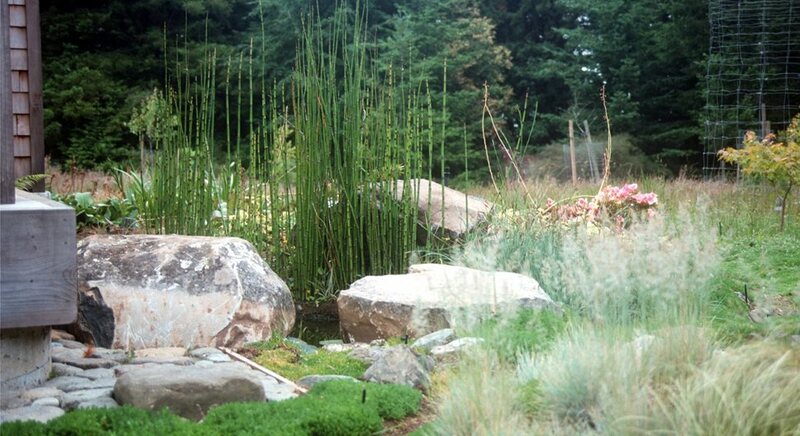 The other solution for high water table landscapes is to raise the planting areas, an expensive but effective option. 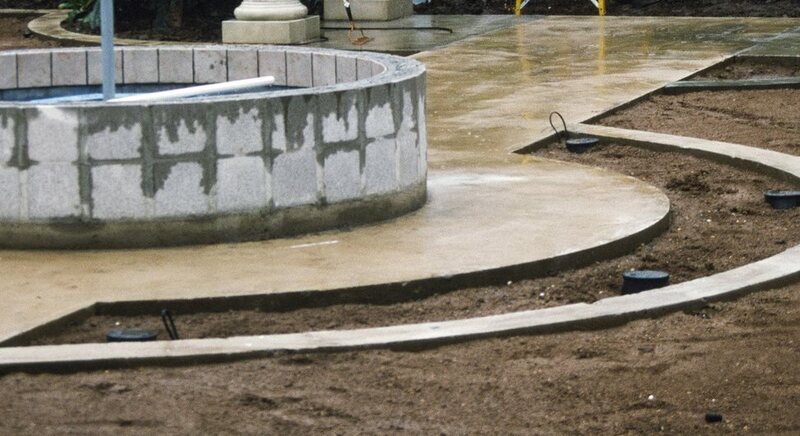 Raised planter heights can vary according to what the designer wants to grow there. 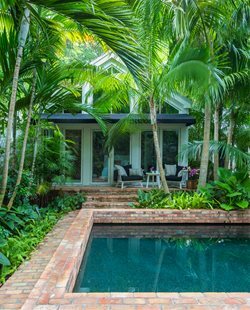 For trees and large shrubs, the size of such planters must be greater to keep the root crown high and dry. The root crown is a woody structure at the base of the trunk from which roots diverge out into the soil. 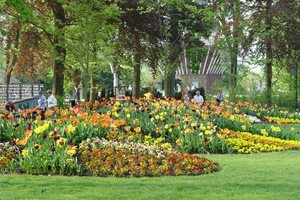 Where planting is limited to smaller shrubs and perennials, the depth of the planter may be shallow and thus less expensive. 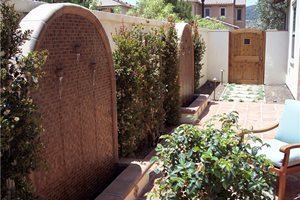 The challenge to your designer is to balance the cost of raised beds with the benefits of her proposed planting.